When Charles turned two, he stopped talking. For well over a year, he did not speak a word. A year ago this month, this amazing kid I write about spoke his first words..again. He now speaks in lengthy sentences and his speech becomes more intelligible each day. A success story. We all have them. Our stories. Some personal, some professional. Some successful, some not so successful. No regrets. The stories make us who we are today, as professionals and fellow human beings. We learn from all of our experiences and interactions with others. Then we continue on our journeys, growing as individuals, affecting those we meet, improving quality of life for others and creating more stories. So what difference did this one client make for me? I can hardly put into words all that I learned from this now four-year old child and his unstoppable, inspiring mom. Both Charles and his mom motivated and challenged me. I can explain it well by looking at the theme of the 2003 MSHA Convention—-The Three C’s: CEU’s, Collaboration, Compassion. If I did not continue educating myself at conferences, reading and workshops, I do not believe I could have effectively helped this child. So, continuing ed is crucial to my growth as an SLP (plus now it is required! J ). When this child came my way, I knew I would be consulting with trusted colleagues—– collaboration . It was very important for me to ‘run ideas and thoughts’ by others..my SLP friends, his speech-language pathologist in his preschool, an audiologist, student clinicians, a social worker, and many others. But I think most of all, it required compassion , which came easily. To feel for fellow human beings, complete strangers. Genuine compassion not only for the client, but for his family as well. Wow. That’s big when you really think about it. 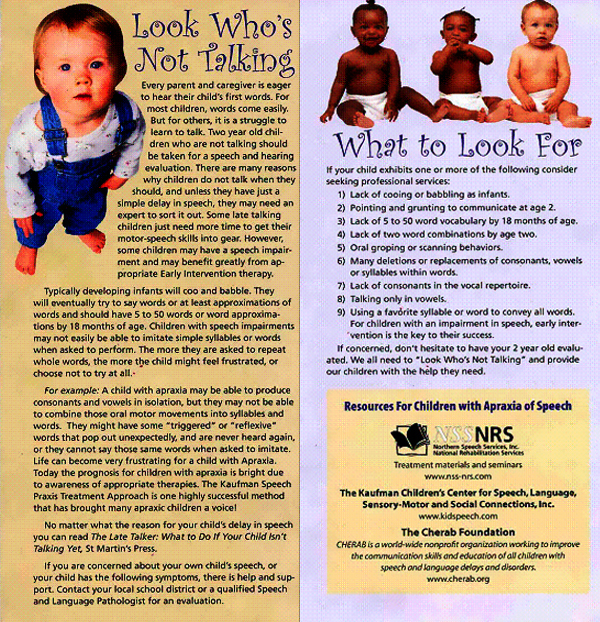 Cherab would like to thank Julie Hoffmann M.A., CCC-SLP, President of the Missouri Speech Language Hearing Association, for giving us permission to repost from the MSHA website the “silent no more” poem/story of hope about one of her pediatric patients who was diagnosed with a speech disorder/apraxia. Cherab would also like to thank Tricia Morin, the Mom behind the child in this poem “silent no more” Tricia.